Allow time for the pastry to chill before rolling, and for each component — the baked pastry and the tart with the lemon curd filling — to cool before proceeding to the next step. The tart tastes best eaten the same day it’s made, but will keep covered in the refrigerator for up to 2 days. 1. Have on hand a 9-inch French tart pan with a removable base. 2. In a food processor, pulse the butter until creamy. Add the confectioner’s sugar, vanilla, and salt. Pulse until combined. Add the egg yolk and pulse to blend it, stopping to scrape down the sides as needed. Add the flour and pulse until just combined but still crumbly (the less you pulse, the better). Gather the crumbs into a ball and press the ball into a flat cake. Wrap in foil and chill for 1 hour. 3. Place the dough between 2 sheets of plastic wrap and, using a rolling pin, roll it slightly thinner than ¼ inch. Remove one piece of the plastic from the dough and lay it dough-side down in the tart pan. Press into the bottom and sides of the pan. With the rolling pin, trim the edges of excess dough. Recover the dough with plastic wrap. Chill for at least 1 hour. 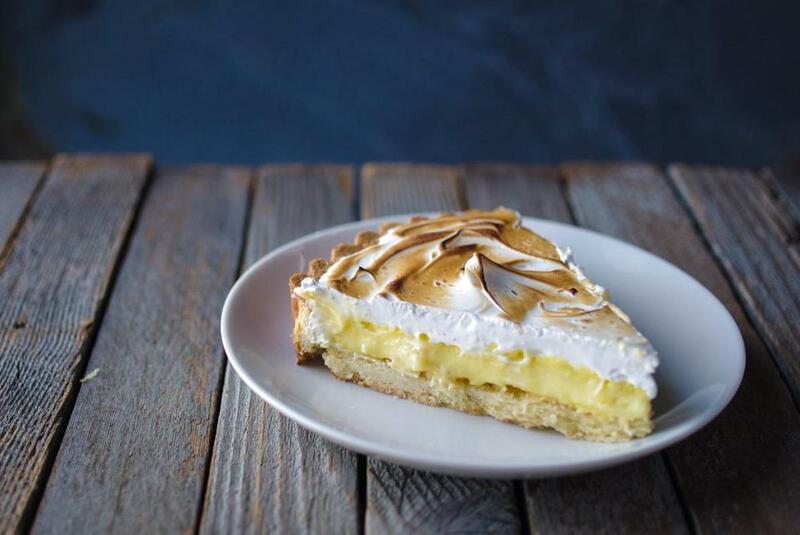 Lemon meringue pie, typically sweet and a diner fixture, is badly in need of a makeover. Time to tinker. 4. Set the oven at 400 degrees. Set a rack in the middle of the oven. 5. Remove the plastic wrap from the dough. Bake the pastry for 25 minutes, or until golden brown all over (check the dough halfway through the cooking. If it puffs up, prick it with a fork to deflate it). Cool on a wire rack. 1. In a large heatproof bowl, work the grated rind into the sugar with your fingers. 2. Bring a large saucepan with 1 inch of water to a low simmer (this will be the bottom of a double boiler.) Set the bowl of rind and sugar over the simmering water. Stir in the whole egg and whisk until the sugar dissolves. Whisk in the lemon juice, egg yolks, and salt. Continue cooking, whisking constantly, until the mixture thickens enough to hold the line of a whisk. Whisk in the cold butter, a piece at a time. Remove bowl from water. Cool to room temperature. Set the saucepan of hot water aside. 3. Set the oven at 325 degrees. 4. In an electric mixer, beat the cream until it holds stiff peaks. Gently whisk the cream into the lemon curd. Pour the mixture into the cooled pastry shell. If the edges of the pastry are dark brown, cover them with foil. 5. 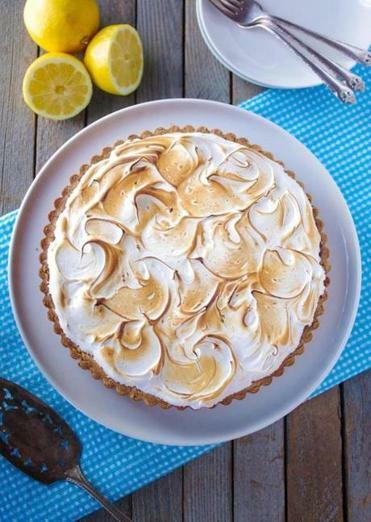 Bake the tart for 20 to 25 minutes, or until the lemon mixture no longer jiggles when the pan is tapped. Cool to room temperature. 1. Bring the large saucepan (with 1 inch of water) to a simmer again. 2. In a very clean bowl of an electric mixer, use a hand whisk to mix the whites and granulated sugar together. Set over the simmering water and continue whisking constantly until the whites are frothy and the sugar dissolves. Remove the bowl; dry the bottom. 3. Transfer the bowl to the mixer stand and beat on high speed for 6 minutes, or until the bottom of the bowl is cool and the meringue forms stiff peaks. 4. Turn on the broiler. Set a shelf about 4 inches from the element. Set the tart on a baking sheet. 5. Spread the meringue over the cool (not cold) tart, from edge to edge (this will prevent the meringue from weeping or shrinking.) Slide the tart under the broiler, watching and rotating as needed, and cook for 30 seconds to 2 minutes, or until browned. Cool.